A mysterious hulking figure prowls a university campus at night and yanks the door off of a locked storage room to steal chemicals -- a guard spots the intruder but before he can react, the man knocks him cold and kills him, carrying the body as if it weighed nothing. The police investigation, led by Lt. 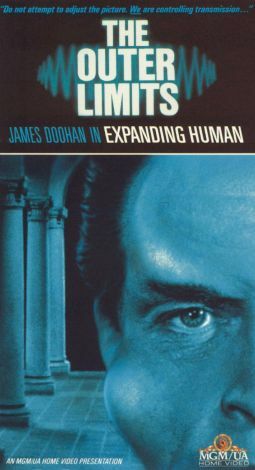 Branch (James Doohan), can't figure out how the door was removed or the guard was asphyxiated -- and the materials that were stolen are fairly mystifying as well, chemicals used in experiments with consciousness-expanding ("CE") drugs. Dr. Peter Wayne (Keith Andes), the head of the drug experimentation program, and his associate (and brother-in-law) Dr. Roy Clinton (Skip Homeier), insist that there's nothing missing that was worth a burglary, much less a murder, but the lieutenant insists on checking out a possible connection between the crimes and a group of students and faculty members who were previously dismissed from the university for their CE experiments. This leads to new puzzlements -- including a man (Aki Aleong) who turns up, seemingly dead, for no apparent reason -- and the murder of a philanthropist associated with the university, apparently committed by a man that no one except Dr. Wayne remembers seeing. And of what significance is one student's claim that he saw Dr. Clinton on campus, at the science building, on the night of the burglary, which Clinton insists can't be true? Or Clinton's suggestion that CE drugs may be at work on others around them, affecting their judgement and their abilities? The story poses lots of questions, as well as momentarily waxing poetic on the potential of consciousness-expansion, and then answers them very slightly too early and quickly, in this otherwise eerie and suspenseful mystery.